Presented for the first time and unrivalled in scale and architectural design, this prestigious riverfront address inspires a new standard of luxury executive living. Defined by its bespoke designer inclusions and exquisite 180 degree vistas encompassing the Brisbane River from the Gateway bridge to the City, this stunning Villa is desirably situated within the esteemed Hamilton Reach community. Delivering a lavish outlook on life, the Villa's effortless combination of bespoke finishes and high end fittings reflect an appealing layout for the design and lifestyle savvy. A gourmet style kitchen fuses contrasting white and sleek grey cabinetry set against calacutta marble & corian bench tops featuring high end Gaggenau European appliances, convenient butlers' pantry and dumbwaiter from the garage. Mirroring its distinctive river and city backdrop, the expansive outdoor entertainer's terrace boasts a magnificent glass framed private swimming pool and sun soaked timber deck with built in BBQ, a dynamic space destined to inspire enviable gatherings with friends and family. Entertaining is complimented by the private Media Room with courtyard, also providing the option of a fourth bedroom with access to a stunning central bathroom. Ascend the feature timber and frameless glass staircase and marvel at the intuitive use of space, exceptional privacy and peace that reflects easy care living on the top level. Elegantly appointed, the sprawling master retreat indulges in its own glass framed viewing balcony and breathtaking ensuite bathroom with views stretching across the river. A further two bedrooms are each serviced by private ensuites, built in robes and are positioned close to the central study. 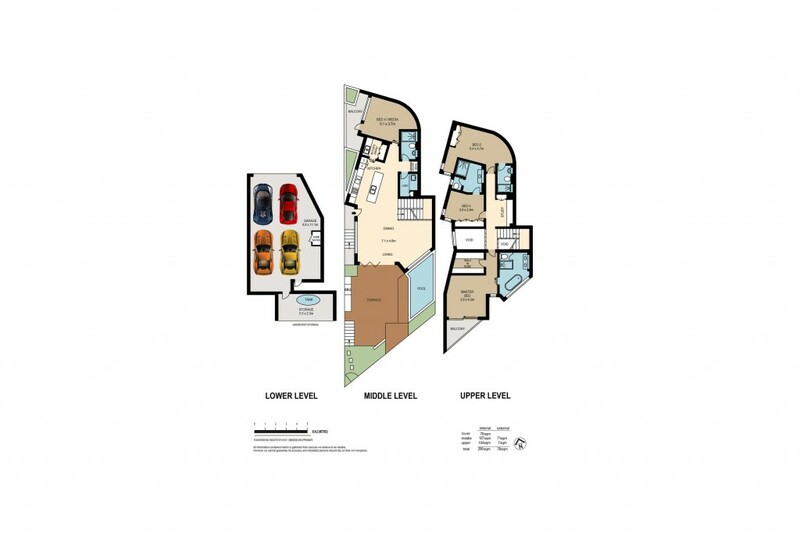 A private four car remote controlled garage featuring ample storage capabilities, fully ducted zoned air conditioning & C-Bus throughout further demonstrates the premium selling features of this executive home. Encouraging a healthy lifestyle with easy access to the picturesque Hamilton Reach walkways, city cat and bike trails, established purchasers can indulge in some of Brisbane's most attractive eateries, designer fashion boutiques and entertainment precincts that Portside, neighbouring Teneriffe, New Farm and CBD play host to. Welcoming a new era for luxury riverfront living, Villa 8, 102 Parkside Circuit is a coveted address most deserving of an inspection.